Sometimes you just have to make sure you look the part. If you’re attending an important social occasion such as a wedding or funeral it might just be best to avoid taking the wheezing, back-firing Fiat Uno that you’ve been driving for years. Nobody wants to see a clown car breaking down beside the bride’s limo. Okay, maybe your car’s fine but you need something larger because you’ll need to fit your aged Aunt Gladys in as well as your 3 kids. And who knows who might also ask you for a lift from the ceremony to the reception? Better hire something big enough, just in case. That way, should the need arise, you can jump in and be the hero. Just because you’re running a start-up business and will, one day, be the next Richard Branson it doesn’t follow that you have a BMW right now. In fact, it would be insane to spend money on running a prestige vehicle just to feed your ego. Every entrepreneur knows that a fledgling business consumes money like a toddler gets through teething rings. But, every now and then you need to impress. When those important buyers come down from London by train ready to give you an order that’ll secure your future, turning up in a two door rusty vehicle with the back seat full of your toddler’s car seat and toys is probably going to leave them wondering whether your business is up to fulfilling their order. That’s the occasion to employ a little guerilla marketing and hire a clean, shiny, well-tended mid-range hire car. Nothing too flashy or they may think you’re wasting your money. Choose something like a Ford or Vauxhall that is reliable but not too blinged-up. If you’re not sure what to choose, ask your car hire company, they’ll be happy to help you pick something from their range. For small businesses a #hirecar can sometimes amount to guerilla marketing. Okay, so you’ve decided that you and your best friends are going on a holiday together. But none of you have a car that’s big enough to fit 5 adults plus all your holiday gear. All those ski jackets, gloves and boots take up a lot of space. The smart option is to hire a large family car with plenty of boot space. Sorted. Alternatively, you’re a family with a couple of teens. Now, every parent of teenagers knows that the only way to stay sane is to give them enough space so that their bags, electronics and legs don’t touch. Anything short of that is likely to cause a minor explosion every 20 minutes of the journey, and who wants to cope with that? The answer? Hire a compact MPV. Tons of room, and plenty of seats. We hired one from Hewitt Hire in Plymouth which could comfortably seat seven people. The result? Silence from the back and bliss for us in the front. Also hiring a car means you won’t have to drag your car all over the place and wear it out. You get a well-maintained vehicle that’s unlikely to break down in an obscure country lane in France. Come by train or plane, it’s the easiest way to get to our beautiful county. But once you’re here, you will need a car to get the best out of it. A hire car means you will be able to drive all over Devon. You can pop into Plymouth for the shopping and world-class events such as the British Firework Championships, music events on Plymouth Hoe, or our famous Flavour Fest which attracts foodies from all over the UK. Drive to Plymouth for the fabulous fresh food served in big-name restaurants and quaint local eateries. Drive over to tour Dartmoor, Exmoor or over into Cornwall. And when your trip is over, pack all your souvenirs into your bags and jump back onto the train, clutching your memories but leaving your car here to be picked up. If you like hassle-free holidays, you should hire a car. Nobody likes to think of it, but occasionally our pride and joy has to spend some time away from us being repaired. When this happens, we’re often able to borrow a courtesy car. Which is very nice, but if you’ve got a family, the car they supply is always too small. I like to avoid stress and strife, so on these occasions, I opt to hire a car that’s a suitable size. There’s a tremendous advantage to using a hire vehicle on an occasional basis. Local car hire firms can give you preferential rates. Because they know you’ll definitely be back in the future, it works out well for them, even if it’s not right away. 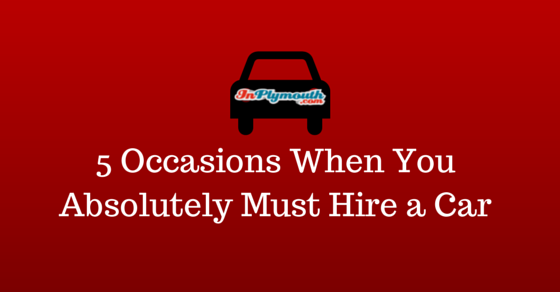 You thought there were no reasons to hire a car if you already had one. Here are five times when it’s a must – and I haven’t even mentioned Christmas – that time when you need a reliable car to get you all over the country delivering presents and visiting relatives. Now there’s a thought, I wonder if they hire out sleighs and reindeer.